1.2 From time to time on www.ukofficedirect.co.uk (the “Website”) we run promotions. 1.3 Only one promotion can be used per order. A promotion may not be used in combination with other promotions or used to collect reward points except where specified. 1.4 Promotional items that you purchase (either free of charge or at a proportional rate) do not qualify nor count towards your basket value in order to redeem further free promotional items. We reserve the right to cancel any order(s) which we deem to have attempted to purchase promotional items in order to increase basket size to qualify for further promotions. From time to time certain products may be excluded from current promotions and any such exclusion will be notified to you through a notice on the Website. 1.5 Excluded products will not count towards any qualifying conditions for offers and will not benefit from any promotional discount. 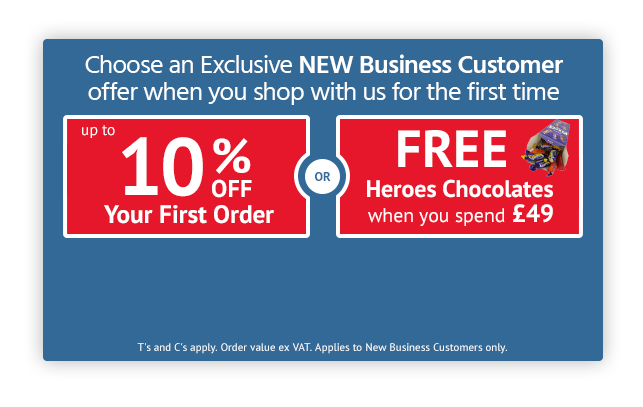 1.6 All promotions are subject to availability and while stocks last. We reserve the right to end a promotion at any time. 1.7 We shall not be liable for any financial loss arising out of the refusal, cancellation or withdrawal of any promotion or any failure or inability of a customer to take advantage of a promotion for any reason. 2.1 From time to time we may offer free gift promotions on the Website. In order to claim a free gift you must quote the relevant gift code when placing your online or telephone order. When shopping online, please enter the gift code in the ‘Promotional Offers’ box in your shopping basket and follow the on-screen instructions. 2.2 Delivery or postal charges may be payable by you in respect of free gifts and this will be made clear to you on the Website where the free gift is advertised. 2.3 Where a free gift is offered subject to a minimum spend requirement, VAT and supplementary charges (such as delivery, gift wrap or postage & packing) may still be payable and shall not count towards a minimum spending requirement. 2.4 If you qualify for a free gift by satisfying a minimum spend threshold and you decide to return some of the goods purchased (and not the free gift) and therefore reducing your order value below the minimum spend threshold, we reserve the right to charge full retail price for the free gift. This amount will be deducted from any refund due back to you for the returned items. 2.5 Similarly, where a free gift is offered subject to the purchase of a specified item, if you decide to return the specified item, you will need to return (at your cost) the free gift to receive a credit or refund otherwise we reserve the right to charge full retail price for the free gift and deduct this amount from any refund due back to you. 2.6 Gifts that are promoted within our catalogues are only available to the recipient of that catalogue and validation may be required before your order can be process. 2.7 Gifts are limited to one per customer per week unless otherwise stated. Only one gift can be claimed with each order and our gift coupons cannot be used in conjunction with any other special offers. We reserve the right to substitute with a product of equal or greater value in the event that stock of a selected gift item becomes unavailable. 2.8 Where possible free gifts earned will be dispatched with your order. If that is not possible we aim to deliver your free gift within 28 working days of you placing your order. 3.1 From time to time we may send you by email or post web-coupons. These are codes which you may input on our website to qualify for certain promotions. Web coupons are subject to these Terms and Conditions and any terms and conditions notified to you at the time of issuance of the web-coupon. 3.2 A web-coupon is redeemed by entering its code at the appropriate point in the purchase process on the Website. 3.3 We reserve the right to withdraw or cancel a web-coupon for any reason at any time. 3.4 Web-coupons cannot be exchanged for cash [or be used to purchase gift vouchers]. 3.5 Unless expressly stated at the time of issue, each web-coupon will be valid for use by the recipient of the web-coupon and by such recipient only once and may not be used in conjunction with any other promotion. 3.6 In accordance with guidelines from HM Revenue and Customs, a web-coupon is treated as cash, therefore VAT is due on the full value of an order and you will be required to pay VAT on the full value of the order, unless otherwise stated in any terms accompanying the web coupon. 3.7 Web-coupons may only be used at the Website. 3.8 From time to time certain products may be excluded from web-coupon offers and any such exclusion will be notified to you along with the web-coupon or through the Website. 3.9 Web-coupons may be limited to redemption in respect of certain products or certain products may be excluded from the ambit of use of the web-coupon, in which case notice will be given to you at the time of issue of the web-coupon. 3.10 Excluded goods and services will not count towards any qualifying conditions for offers and will not benefit from any promotional discount. 3.11 No web-coupon may be copied, reproduced, distributed, or published directly or indirectly in any form or by any means for use by an entity other than the original recipient, without our prior written permission. 3.12 Web-coupons distributed or circulated without the written approval of UK Office Direct, for example on an Internet message board or on a "bargains" website, are not valid for use and may be refused or cancelled. 3.13 When you use an web-coupon you warrant to us that you are the duly authorised recipient of the web-coupon and that you are using it in good faith. 3.14 If you redeem, attempt to redeem or encourage the redemption of web-coupons to obtain discounts to which you or a third party are not entitled you may be committing a civil or criminal offence. 3.15 If we reasonably believe that any web-coupon is being used unlawfully or illegally we may reject or cancel any web-coupon and you agree that you will have no claim against us in respect of any rejection or cancellation. We reserve the right to take any further action it deems appropriate in such instances. 3.16 If we refuse a web-coupon submitted as part of an order, for any reason, we will inform you before the order is dispatched to advise of the correct cost of the order and give you the opportunity to cancel the order. 4.1 We mark products that qualify for discounts with a green tick next to the price in your shopping basket. Products which do not display the green tick are not eligible for further discounts. 4.2 Where an online offer states that a discount is given on a purchase up to a stated percentage, the discount given will only be applicable to qualifying products and the percentage of discount given will vary between qualifying products. 4.3 Supplementary charges such as delivery or postage & packing shall not be discounted unless specifically stated in the promotion description. 4.4 Refunds for goods purchased under a promotional offer will be based on the terms of the promotional price. Your statutory rights are not affected. 5.1 From time to time we run free to enter prize competitions on the Website. 5.2 Competitions are open to residents of the United Kingdom who access the Website from the United Kingdom. All participants must be aged 18 or over (“Participants”). In consideration of us making the Competitions available to you, you agree to be bound by these Promotions Terms and Conditions. 5.3 Employees of UK Office Direct, its subsidiaries or affiliated entities and their immediate family members are not eligible to enter prize competitions. 5.4 All competitions will state the opening date and time and the closing date and time and the competition will only be open for that term. 5.5 All competitions on our Website are free to enter and, unless stated, there is no limit as to how many times a Participant may enter a single competition. 5.7 The winner will first need to qualify for the competition by passing the skill, judgement or knowledge test in accordance with the rules of the specific competition, the winner will then be chosen at random from those Participants who have successfully passed the skill, judgement or knowledge test (the “Winner”). Our decision is final and no correspondence will be entered into. 5.8 A Winner will receive the prize detailed on the competition entry page (the “Prize”). The Prize is non -transferable. There is no cash or other alternative. We reserve the right to substitute a Prize of like value in the event that the awarded Prize is unavailable for any reason whatsoever. 5.9 Winners of the competition will be notified by e-mail as soon as reasonably practicable after the competition has ended. Prizes will either be emailed to the Participant’s registered email address where the prize is a non-physical digital item (such as a web coupon) or sent to the Participant’s registered address. 5.10 Winners of the competitions may be displayed on the web site in the format title surname area e.g. Mr Jones from Birmingham. You hereby consent to this use. 5.11 Competitions may be subject to additional rules. If so, these additional rules will be listed on the relevant competition entry page and form part of this agreement. 5.12 By registration on entry to the competition, Participants indicate that they have accepted these Terms and Conditions. 5.13 We accept no responsibility or liability for loss to any person or property relating to the award of any Prize save for death or personal injury caused by our negligence for which our liability is unlimited. 5.14 We reserve the right to cancel the award of the Prize at its sole discretion without prior notice if the Prize cannot be delivered to the postal address indicated by the Winner and is returned to us. 5.15 Should we cancel a win for the above reason or otherwise in our sole discretion no form of compensation will be offered to the Winner. 5.16 We will not be liable for any malfunction or event beyond our reasonable control which prevents entry to the competition or fulfilment of the prize. By participating in the competition Participants agree to this condition. 5.17 We will not be liable for any loss or damage to property whether material, financial or other which may occur when taking part in the competition.